The ʻAha Pūnana Leo’s Hawaiian language preschools in Hilo, Hawaii have been granted by the World Indigenous Nations Higher Education Consortium (WINHEC) the first accreditation of an early education program conducted through an endangered and indigenous language worldwide. A distinguished team of international educators from countries that have records of high academic achievement in multiple languages, such as Scandinavia and New Zealand, conducted the new preschool through high school assessment. The accreditation serves as the base from which WINHEC seeks to develop distinctive support for indigenous early education worldwide. As the first in the world with this international accreditation, Hawai’I’s Pūnana Leo schools are setting the bar for Early Childhood Education in indigenous languages worldwide. You can learn more about Pūnana Leo here. Ward, C., Jones, K. W., Madsen, B., Coles, R., Rich, L., & Knapp, S. (2014). 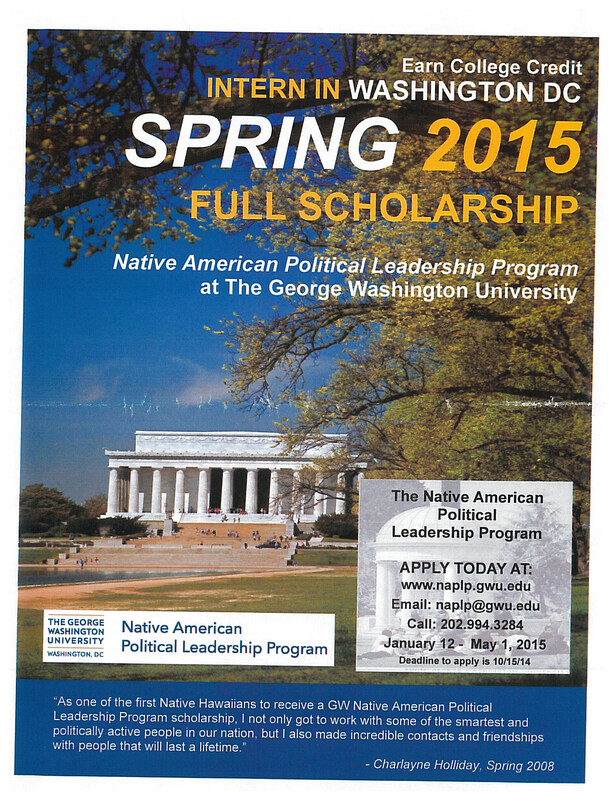 Mentored research in a tribal college setting: The Northern Cheyenne case. Journal of Research in Rural Education, 29(3), 1-17. The current study, which focuses on mentored research experiences of freshmen and sophomores at the tribal college of the Northern Cheyenne Nation, responds to the call by Ovink and Veazey (2011) for additional study of effective strategies for providing both mentoring and research experiences for minority undergraduates. We use qualitative data—interviews and observations—to explore the meanings rural tribal college students give to their mentored research experiences and the impact on their academic plans. Findings show that effective mentors develop trust and support for student learning and their personal goals. The data also suggest that successful mentoring strategies facilitate learning by doing and relating to the student’s worldview and context. Additionally, non-native instructors who engage in authentic, caring interactions with students can successfully mentor native students in a supportive tribal college context. Tribal college students indicate that, similar to many American Indian university students, they want to return to their reservation communities following completion of college. However, tribal college students bring these interests into their academic plans as freshmen and sophomores. We conclude that appropriate mentoring relationships and relevant research experiences empower tribal college students to pursue their academic goals both in and outside their community as well as prepare to return. The Journal of Research in Rural Education publishes research that is of demonstrable relevance to educational issues within rural settings. JRRE welcomes single-study investigations, historical and philosophical analyses, research syntheses, theoretical pieces, and policy analyses from multiple disciplinary perspectives. We welcome manuscripts concerning learning and instruction; preservice and inservice teacher education; educational leadership; educational policy; rural education and community development, and the cultural, historical, and economic context of rural education. Brief commentary on recently published JRRE articles is also appropriate. The Departments of the Interior, Health and Human Services, and Education invite tribal and school administrators implementing Native language activities and receiving funding from the Administration for Children and Families, the Bureau of Indian Education, and/or the Department of Education to a Native Languages Summit being held on June 20, 2014. The conference is coordinating federal partners and Native education stakeholders working with Native language programs to discuss methods for improving accountability for educational progress and measurable success. The Summit’s goal is to ensure the preservation and acquisition of Native languages, so Native youth can learn and revitalize their linguistic and cultural heritage and improve their educational outcomes. Attendees will discuss challenges and best practices for measuring and preserving oral and written Native languages. For additional questions, please contact: 877-922-9262. NIEA is excited to provide our membership the next webinar date in our monthly series. Join NIEA and Dr. Walter Kahumoku III on June 25, 2014 for an opportunity to learn about infusing culturally-based education (CBE) models into the Common Core State Standards. Research studies identify that CBE components are critical for improving Native student academic achievement. Dr. Kahumoku specializes in Common Core implementation that respects cultural components and will provide educators and stakeholders examples and best practices for your local institutions. Knowledge and use of the community’s political and social concepts. For more information, please contact Diana Cournoyer at dcournoyer@niea.org. Have a good smile today!